DrugPatentWatch offers PDF copies of the FDA Orange Book dating back to 1980. The Food and Administration (FDA) Orange Book, or Approved Drug Products With Therapeutic Equivalence Evaluations, is an authoritative list of patents covering branded drugs, and of generic equivalents. 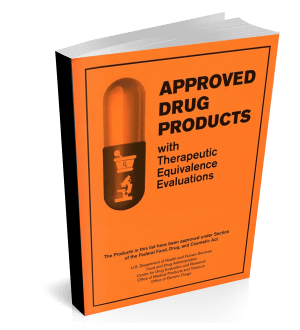 The Orange Book identifies drug products approved on the basis of safety and effectiveness by the FDA under the Federal Food, Drug, and Cosmetic Act. Each edition includes a list of unexpired patents covering drugs, as of the date of publication. Orange Book archives are very potent research tools, but until now there has been no central source to get the complete set of archives.